Contact Mark Wells for more information about this commercial property. Se habla español. I found your listing on AgentMarketing. Please send me more information about 3607 Compton Drive in Mission as soon as possible. This tract of land would be ideal for residential development . The City of Mission has installed a water and sewer lines along 2 Mile Line on south side. The subject property measures approx. 600 X 503.25 and has orange trees that are currently in operation. 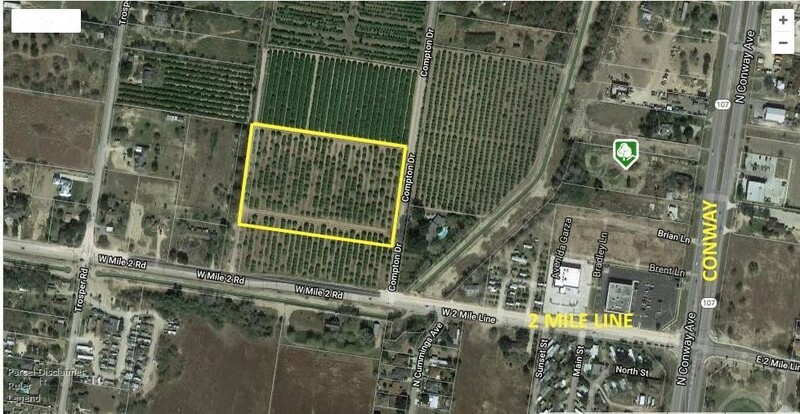 The subject property sits behind a tract of land (On 2 Mile Line) that has been zoned commercial. That commercial strip is also for sale and MLS # for that property is A221867.